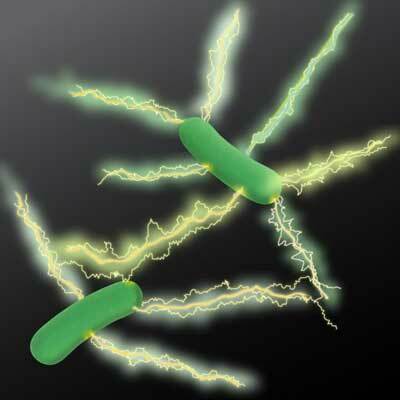 (Nanowerk News) Microbiologists at the University of Massachusetts Amherst report that they have discovered a new type of natural wire produced by bacteria that could greatly accelerate the researchers' goal of developing sustainable "green" conducting materials for the electronics industry. The study by Derek Lovley and colleagues appears this week in mBio ("Expressing the Geobacter metallireducens PilA in Geobacter sulfurreducens Yields Pili with Exceptional Conductivity"), the American Society of Microbiology's premier journal. The researchers studied microbial nanowires, protein filaments that bacteria use naturally to make electrical connections with other microbes or minerals. As Lovley explains, "Microbial nanowires are a revolutionary electronic material with substantial advantages over man-made materials. Chemically synthesizing nanowires in the lab requires toxic chemicals, high temperatures and/or expensive metals. The energy requirements are enormous. By contrast, natural microbial nanowires can be mass-produced at room temperature from inexpensive renewable feedstocks in bioreactors with much lower energy inputs. And the final product is free of toxic components." "Microbial nanowires therefore offer an unprecedented potential for developing novel materials, electronic devices and sensors for diverse applications with a new environmentally friendly technology," he adds. "This is an important advance in microbial nanowire technology. The approach we outline in this paper demonstrates a rapid method for prospecting in nature to find better electronic materials." Until now Lovely's lab has been working with the nanowires of just one bacterium, Geobacter sulfurreducens. "Our early studies focused on the one Geobacter because we were just trying to understand why a microbe would make tiny wires," Lovley says. "Now we are most interested in the nanowires as an electronic material and would like to better understand the full scope of what nature may have to offer for these practical applications." When his lab began looking at the protein filaments of other Geobacter species, they were surprised to find a wide range in conductivities. For example, one species recovered from uranium-contaminated soil produced poorly conductive filaments. However, another species, Geobacter metallireducens - coincidentally the first Geobacter ever isolated - produced nanowires 5,000 times more conductive than the G. sulfurreducens wires. Lovley recalls, " I isolated G. metallireducens from mud in the Potomac River 30 years ago, and every couple of years it gives us a new surprise." In their new study supported by the U.S. Office of Naval Research, they did not study the G. metallireducens strain directly. Instead, they took the gene for the protein that assembles into microbial nanowires from it and inserted this into G. sulfurreducens. The result is a genetically modified G. sulfurreducens that expresses the G. metallireducens protein, making nanowires much more conductive than G. sulfurreducens would naturally produce. Further, Lovley says, "We have found that G. sulfurreducens will express filament genes from many different types of bacteria. This makes it simple to produce a diversity of filaments in the same microorganism and to study their properties under similar conditions." The researchers attribute G. metallireducens nanowires' extraordinarily high conductivity to its greater abundance of aromatic amino acids. Closely packed aromatic rings appear to be a key component of microbial nanowire conductivity, and more aromatic rings probably means better connections for electron transfer along the protein filaments. The high conductivity of the G. metallireducens nanowires suggests that they may be an attractive material for the construction of conductive materials, electronic devices and sensors for medical or environmental applications. The authors say discovering more about the mechanisms of nanowire conductivity "provides important insight into how we might make even better wires with genes that we design ourselves."